Lighthouses are a navigational tool for mariners, a point of reference in travel on and off land, and a thing of beauty and history. 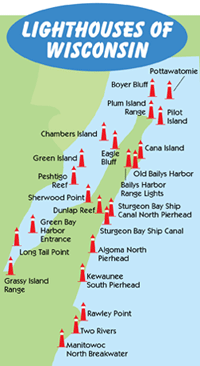 In Northern Michigan, there are many working lighthouses that assist boaters. And here you'll find historic lighthouses where lighthouses keepers once lived and worked that have been preserved, restored and are open to visitors. 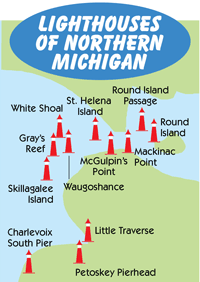 From the Straits of Mackinac to Charlevoix, this part of Up North Michigan has a variety of lighthouses. Many of these elegant structures were built in the 1800s and are now maintained by volunteers and historical organizations. Tour historic lighthouses and get a glimpse of what life was like for the lighthouse keeper and his family. The keeper at McGulpin Point moved his family to nearby Mackinaw City in the winter months so his children could go to school but he traveled back to the lighthouse once a week on snowshoes to report on the lake and ice conditions. See the living quarters where the keeper's families raised children and view Lake Michigan from the top of the elegant towers. Lake Michigan can be calm and glass-like or wild and turbulent just as it was in the lighthouse keeper's day. Some things don't change. 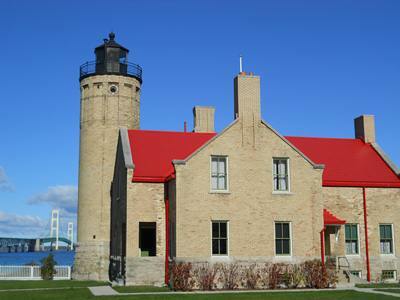 Two Northern Michigan Lighthouses, McGulpin Point Lighthouse and Old Mackinac Point Lighthouse, are open for tours. Just down the hillside from McGulpin Point Lighthouse is McGulpin Rock first noted by French Explorers in 1615. 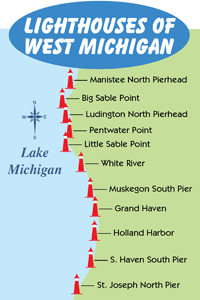 Other Working Northern Michigan Lighthouses can be seen from the water. 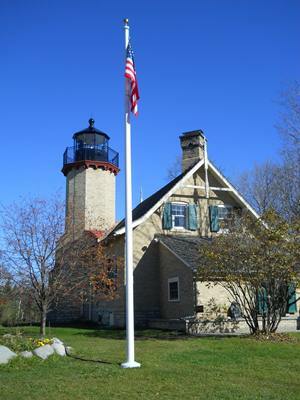 In Harbor Springs, the Little Traverse Lighthouse can be seen from the water and from the shoreline around Little Traverse Bay. 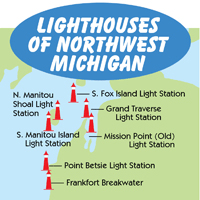 Still gracing the Northern Michigan waters as they have for more than a century, these lighthouses are a special Up North treat.